Sorry that I was MIA for a little while, but March was super busy and fun too! We went to Disney World on Spring Break and a week and a half later I tagged along on my husband's business conference to New Orleans. Both were a blast! I'll share more on those later. I hope you all had a wonderful Easter and enjoyed time with your family. We always attend the sunrise service at our church, which is followed by a potluck breakfast in the church fellowship hall. A couple hours later we go to my parents farm for a huge Easter lunch and egg hunt for the kids. This year I made Raspberry and Almond Baked Oatmeal for the church potluck. This recipe makes a large 9 x 13 pan, but I decided to make it in two smaller dishes. Now I have breakfast for the rest of the week! Preheat oven to 375 degrees. Spray a 9 x 13 inch bake dish (I used two smaller dishes). In a large bowl, combine oats, quinoa, baking powder, cinnamon and salt. In a small bowl, whisk together the egg, milk, honey, coconut oil and vanilla. Place sliced bananas in the bottom of your bake dish. 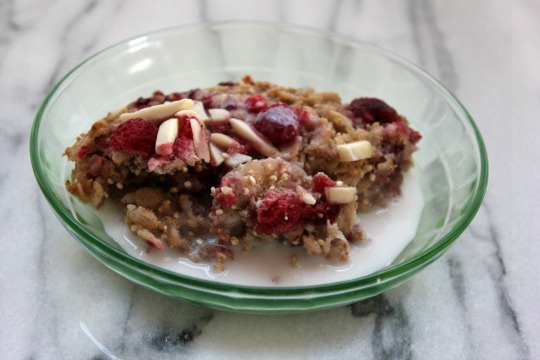 Top with half of the raspberries and half of the almonds. Cover with the oat mixture. Pour the wet ingredients evenly over the oats. 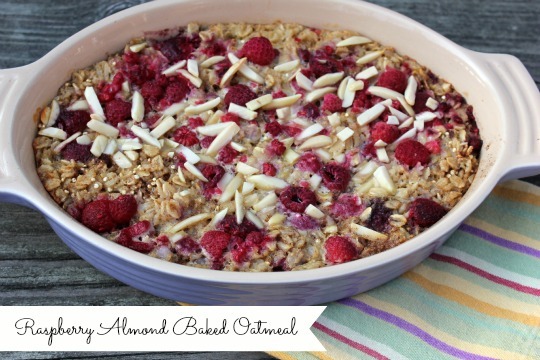 Top with remaining raspberries and almonds. Bake for 30 minutes or until set. Serve plain or with a drizzle of almond milk. Note - If you do not have quinoa or wish to use it, then just replace it with 1/4 cup additional oats. I like the nutty flavor the quinoa provides. Recipe from The Fountain Avenue Kitchen. I will be making this soon, it looks so good!